As I get more involved in the world of Steampunk, I've found one particular thing kind of funny, or actually ironic. Many people involved in steampunk had almost an instinctive interest in this genre without ever knowing it had a name. I suppose for me it should come as no surprise. I've been surrounded by items related to the Victorian era for ages. But I still recall the first time I made what would now be considered a 'steampunk' drawing (for the record it was the late 1980s). The drawing was an idea for a cool design on a magic prop, but I had no idea about the world of steampunk at the time. So my interest in steampunk stuff began long ago. If you're wondering what these Victorian era things are that I'm surrounded by, they are magic posters. them. 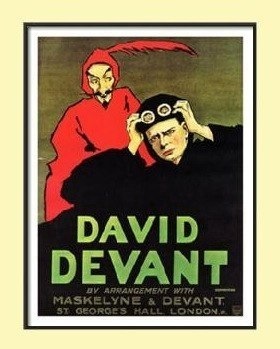 The first is of David Devant the great British Magician and one time partner of John Nevil Maskelyne. The poster was actually painted by a famous artist of the time whose name escapes me. Devant had several posters created by the same artist. This one with the goggles strikes me as the most 'steampunk' of the bunch! David Devant was the most popular English magician of his day and frankly throughout most of the 20th Century. He was also a genius. He saw the Lumiere Brothers invention called The Cinematograph and recognized the importance and potential for popularity of this machine. Though he was unable to obtain a projector from the Lumiere Brothers, he did find someone who could build one for him and he was soon showing movies at the Egyptian Hall Theatre. There is actually film footage that exists of David Devant from that time. The footage is brief, only 32 seconds but captures a joyful Devant pretending to do magic but actually relying upon camera tricks. The next poster belongs to The Great Herrmann, Alexander Herrmann. One of the wonderful aspects popular in the Victorian Era and thus popular with steampunkers is facial hair. This poster captures that quality quite well. Alexander Herrmann was from a family of magicians. His father Samuel and older brother Compars were both magicians. 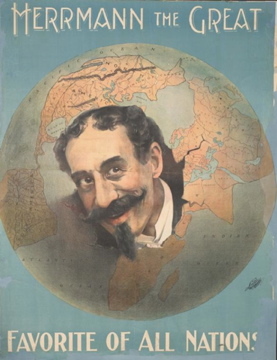 In fact, Compars was extremely popular all over Europe and according to legend, kidnapped his younger brother Alexander to make him part of his show. When Compars decided to leave America and return to Europe, Alexander stayed behind and eventually became the pre-eminent magician in the US. Alexander would die on a train while on tour in 1896. His wife Adelaide took over the show and along with her nephew Leon Herrmann, began to tour again. She and Leon did not stay together long and they eventually went their separate ways. Last year, Adelaide Herrmann's memoirs were located and published and they are an exciting record of performing in the Victorian Age. 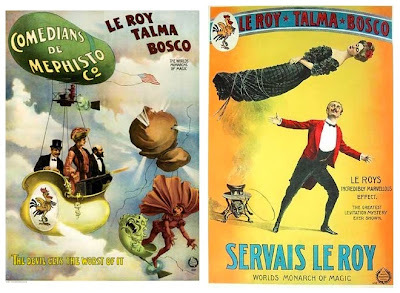 Now, some of the best posters for the Victorian flare have to come from Servais LeRoy. These are his troupe, LeRoy-Talma-Bosco, known as the Monarchs of Magic. They have it all, crazy mustaches, tuxedos, great gowns, hot air balloons and just the overall steampunk feel. Servais LeRoy was a genius when it came to magic. Many of his effects are still performed today, though I doubt many remember that he was the creator. The last years of his life were rather tragic unfortunately. You can read about it here. 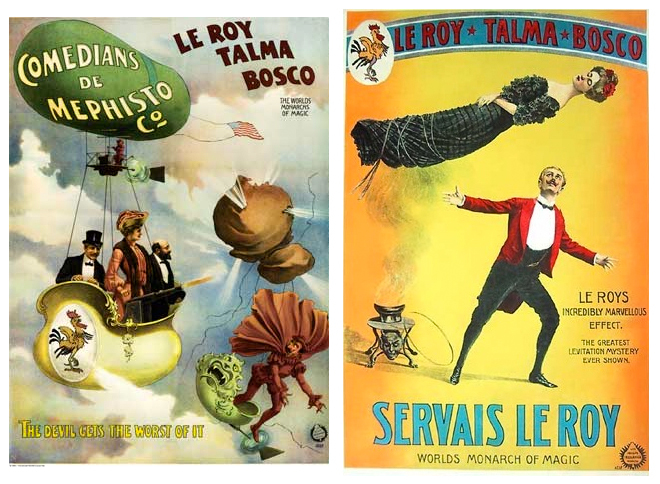 Our final set of posters come from another iconic magic figure from the Golden Age of Magic. He was Harry Kellar and he assumed the role as #1 Magician in America after Herrmann died. He was actually first nationally famous magician who was American born. So popular was Harry Kellar that it is said he was the inspiration for the character of the Wizard in L.Frank Baum's novel The Wizard of Oz. 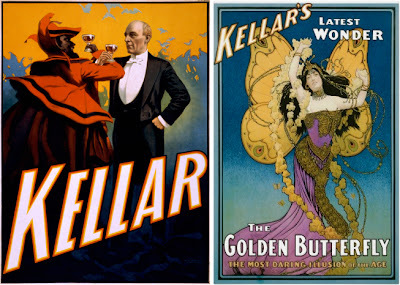 Harry Kellar became famous for his posters with pictures of the Devil or devilish imps. Though he was not the first to use this imagery. His predecessors Robert Heller and Alexander Herrmann both used devils in their advertising. In fact, Robert Heller was known to promote his appearances with the slogan, 'Go To Hell-ers'. Harry Kellar had a long prosperous career and then sold his show to up and comer Howard Thurston who continued the tradition of the big traveling illusion show for many years. I have written about all of the above performers on my magic history blog TheMagicDetective.com so if you're interested, go over there and take a look.